Hello! I hope you have all been loving this sunshine as much as me, although it isn't as great today. I have been really enjoying making the most of it with shopping trips and picnics! The post I am bringing to you today is long over due as I have been using this product for a long time now. I do prefer to give it a long while before I make my mind up about something though because opinions can easily change. The Topshop makeup range is vast becoming one of my favourite ranges. 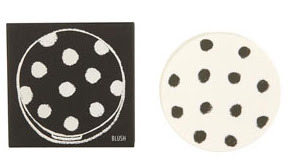 I love the cute white polka dot packaging as it's so unique and stylish and I think it's really reasonably priced. I have a few of their lipsticks and now I am a Topshop blush convert. This is definately the best way to describe the blushers because they are like nothing else I have ever tried. They really are light and between a cream and a powder. 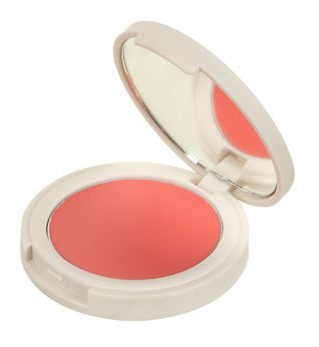 I got the blush in Neon Rose as I personally prefer a darker pink/red because I think it suits my complexion the most. The other shades in the collection are Prime Time (which is a bright pink), Head Over Heels (a coral) and Flush (which is a much darker red). I love the names and I love the different range of colours. I am keen to add Head Over Heels to my collection. I do apologise for the lack of real photographs but unfortunately my blusher is not in the best condition for inspection. The one downfall I find with the blushers is they seem to attract fluff (which I have no idea why). It's not just me because my friend Megan from Meg's Budget Boutique has a similar problem. I think at £6 and £5.40 with student discount is an amazingly good price for such a lovely product. As I have said I have had mine for months now and I can hardly see a dent in the blush. Because it is so pigmented, it goes a long way. I find the best way to apply the blush is with my Real Techniques stippling brush because you literally only need to dab about once into the blush to get the desired effect. I hope you liked my insight into the Topshop blushes. Have any of you tried them?